Rather than sending visitors on a chronological forced march through time in the Fighting for the Nation Gallery, the National Museum of the U.S. Army will provide a focused and unique series of exhibits that from the outset get to the heart of the history of the United States Army’s role as a newly created fighting force. As visitors enter the Founding the Nation section of the gallery they will discover how General George Washington molded a group of diverse, ragtag citizen-soldiers from all thirteen colonies into a uniquely American Army that met and defeated Great Britain, one of the most powerful military forces in the world at the time. Visitors will learn, for example, that had it not been for COL Henry Knox, the fledgling Continental Army may not have had such success against the British. 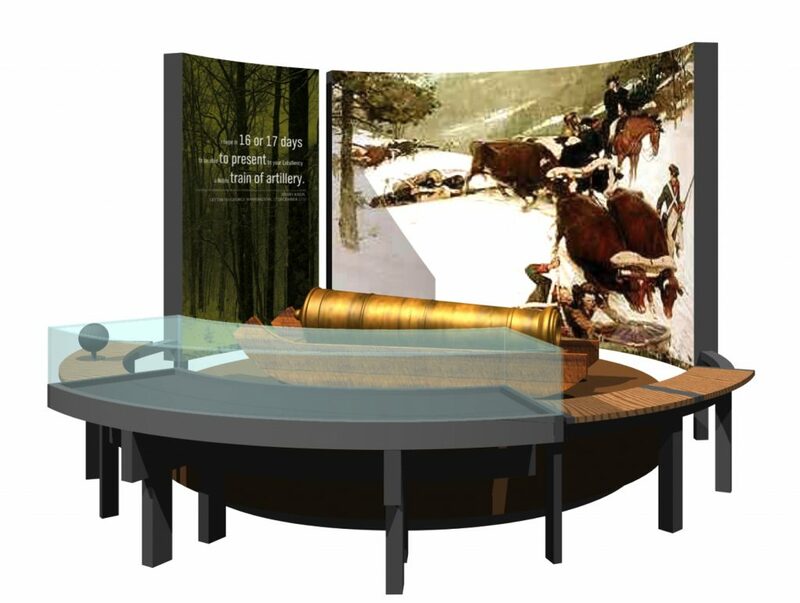 The Knox Trail Diorama will be among the first exhibits to illustrate the story of the monumental task Washington had in creating a military force from scratch. In November 1775, Washington approved Knox’s plan calling for the transport of captured British artillery pieces from Fort Ticonderoga, N.Y. to Boston, Mass. Led by Knox, the expedition consisted of hundreds of men and a hundred teams of horses and oxen pulling sleds that hauled 56 cannon and mortars weighing over 60 tons all the way to Cambridge, Mass. by mid-January 1776. The newly acquired guns were then deployed to Continental Army positions atop Dorchester Heights near Boston, forcing the British garrison to evacuate Boston in mid-March and ending their eight-year occupation of the city. The Knox Trail Diorama will consist of artist Tom Lovell’s painting, “The Noble Train of Artillery,” which commemorates Knox’s daring transport of the captured British cannons across 300 miles of icy waterways and frozen fields from Ticonderoga to Boston. The painting will be set amidst a captured British 6-pounder bronze cannon, and the diorama will invite visitors to imagine the logistical challenges of transporting the artillery pieces. In addition, visitors will learn that Knox participated in nearly every significant battle in the Revolutionary War and eventually served as the chief artillery officer of the Continental Army. They will also learn how many of the other offices and systems Washington and Congress created during the Revolutionary War evolved into many of today’s branches of the Army.